We at Teplar, along with in-depth analysis and deep-down research of client requirements, exhibit a wide range of proficiency in creating, implementing and deploying customized applications, for clients worldwide executing the latest tools & technologies. Our Custom Software Services are reflections of the top-class project execution methods and QA practices that we follow keeping in mind the best of quality and timely deliveries to our esteemed customers. We ensure that our solutions seamlessly accommodate inclinations and expectations of our clients, keeping in mind the specific user-based functionalities and thereby, garner a higher satisfactoriness with an abridged implementation cycle time. Leveraging our experience over wide range of industries from small to medium businesses to help them grow, profit and succeed. As a Custom Software Development Company in India, it has been Teplar's constant endeavor to offer swifter turnaround time to our esteemed clientele with the use of most modern frameworks, reusable mechanisms and fast action tools. 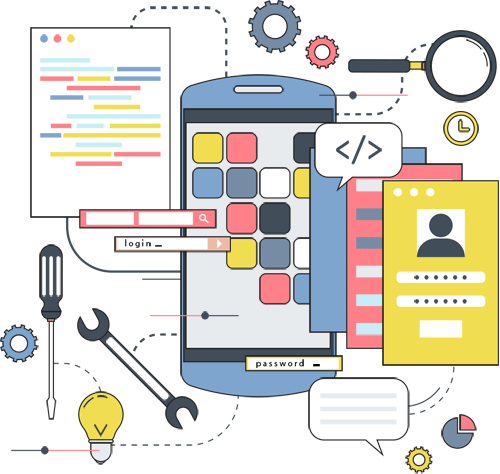 Why TEPLAR for Custom App Development? Committed to Quality; ensuring a striking balance between Cost, Scope and Time for every endeavor. With numerous software solutions delivered and implemented for our vast clientele, quality assurance is on the pedestal of our work. Providing multi-technology, multi-domain, multi-location implementations for critical business systems and Enterprise Mobility Solutions motivated by modern day mobile technologies. Not only during development and implementation, our partnership with our esteemed clientele goes beyond that and assists our clients in maximizing their business growth. With our well-planned strategies and solutions, we help our clients save big on cost, time and efforts.